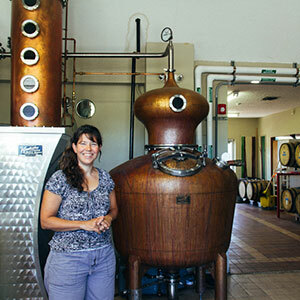 A distiller as unique as her spirits, Caitlin Prueitt was the Willamette Valley’s first woman distillery owner and one of only five in the nation when she launched Vivacity Fine Spirits in December 2011. A non-traditional student at Oregon State – she was 30 when she graduated in 2000 – Caitlin originally was interested in studying nutrition so she could use that knowledge to create diets for chronically or terminally ill people in order to alleviate their symptoms. But after discovering food science and fermentation, the rest, as they say, is history. She completed an internship at a brewery in Germany, worked at wineries in California and spent five years at Oregon State as a hops research chemist before deciding to take the plunge and look into what it would take to open a distillery. She and her husband, Chris Neumann, took classes in California and Michigan, networked, looked into logistics and financing, talked with local artists about designing their iconic labels and filled out a mountain of paperwork. They then began crafting vodka in 2010 in a 2,400-square-foot facility in Lewisburg, on the edge of Corvallis. But don’t let the whimsical nature of this little distillery fool you – these are serious spirits. In addition to being sippable – “With a well-crafted spirit, you should be able to sip,” Chris says – they are sourced responsibly and true to Oregon’s pioneering spirit. For instance, Native Gin bursts with the best flavors of the state. And it was a gamble, Caitlin says. They already offered a gin, but wanted to try something new and more botanical. The result was a hit; Native Gin is a bestseller. Vodka | corn based, filtered 30 times, first product, launched December 2011. Label designed by local designer, who also designed labels for both gins. Bankers’ Gin, Native Gin | Banker’s is a classic London dry with six ingredients, named in honor of the banker who awarded their original loan. Native gin is 17 ingredients, nine native, all locally sourced but cardamom. Native is a botanical gin and a self-described calculated risk that makes the perfect G&T. Both are corn based. Turkish Coffee Liqueur | Vodka based, coffee infused from beans sourced from Corvallis’ Oregon Coffee and Tea. Hints of cardamom, raw sugar and cinnamon. Label designed by Western Oregon University art student. Traditional Rum | Aged in bourbon barrels, made with raw sugar and molasses. Looked at traditional rum houses, which use a dunder pit, unlike most modern distilleries. Smooth, strong, raw ingredients and a unique blend. Ages in bourbon and oak barrels one to two years. Label designed by local art teacher. Caitlin and Chris operate Vivacity out of a 2,400 sq. feet facility in Lewisburg, Ore. The couple can produce four bottles at a time, which are hand labeled. Vivacity crafts 1,500 cases each year. Vodka and Native Gin are bestsellers. 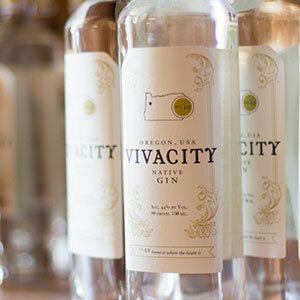 Vivacity spirits are in one-third of liquor stores in the state and in most all liquor stores in Portland. Vivacity employs two full-time staff and three part-time staff. Vivacity is open every Saturday for tasting. Brandy will be released in January 2017. It’s currently in four wine and port barrels. Caitlin is a New York native who moved to San Diego at 18. Caitlin’s sister, Sara, received her master’s degree at Oregon State in 1998. “First, relax. Don’t rush, and don’t sweat the small stuff. Most good things don’t come quickly, and you have all the time in the world. Having said that, don’t rest on your laurels either.